This amazing Pad Thai recipe is easy and approachable and can be made in under 30 minutes. 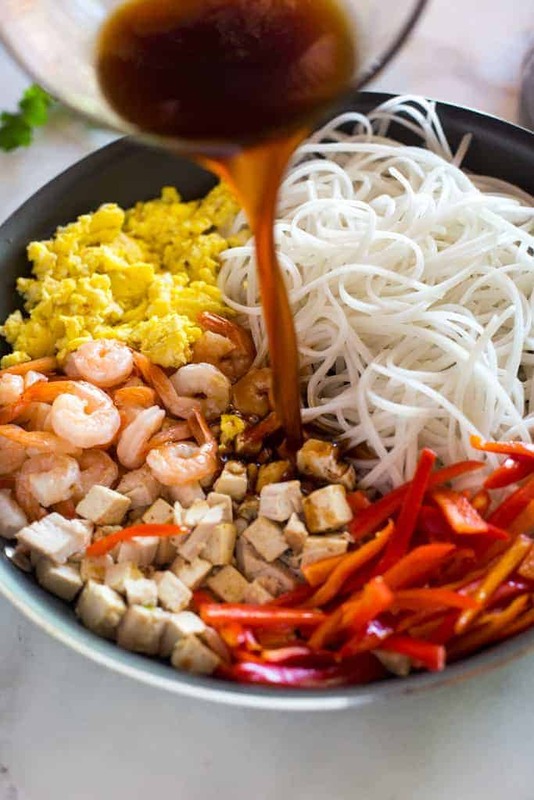 It starts with fresh ingredients including rice noodles, chicken, shrimp, tofu, cilantro, bean sprouts, peanuts and scrambled eggs tossed in a delicious homemade pad thai sauce that is so good it tastes like it came from your favorite Thai restaurant. 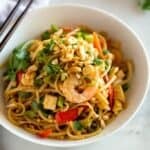 I’ve not kept my love for Thai food a secret here (here are some of my favorite Thai recipes), but I really can’t believe it’s taken me so long to share a homemade pad thai recipe. Just see the recipe card for proof of how easy it is to make from home! 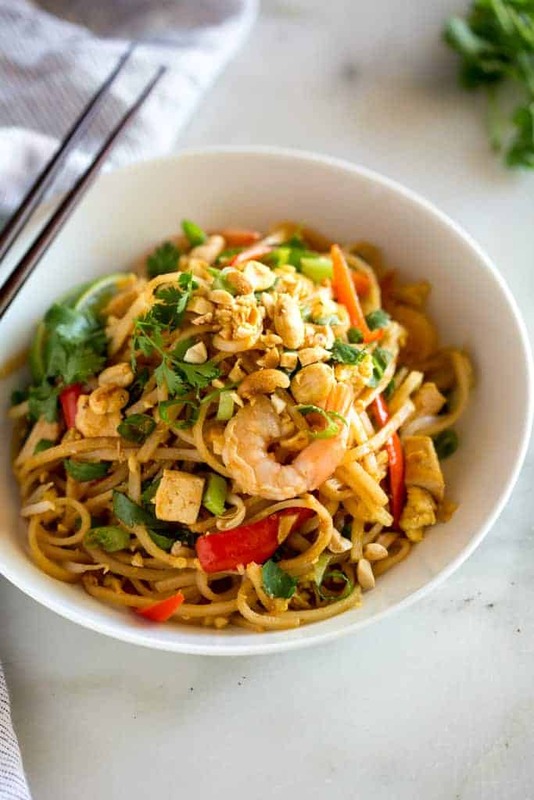 Pad Thai is stir-fry dish made with rice noodles, shrimp, chicken, or tofu, peanuts, a scrambled egg and bean sprouts. The ingredients are sautéed together in a wok and tossed in a delicious pad thai sauce. It’s common street food in Thailand and one of the most popular menu items at Thai restaurants around the country. To make vegan or vegetarian pad thai, leave out the egg and substitute the fish sauce for more soy sauce. Traditional pad thai sauce includes fish sauce, vinegar, sugar and tamarind paste. Tamarind paste is not easily found at a regular grocery stores so I substituted rice vinegar. If you would like to use tamarind paste, substitute about 2 Tablespoons in place of the rice vinegar in this recipe. I also added a big scoop of peanut butter to my sauce, because I think it gives the whole dish an added creaminess and boost of flavor that I love. 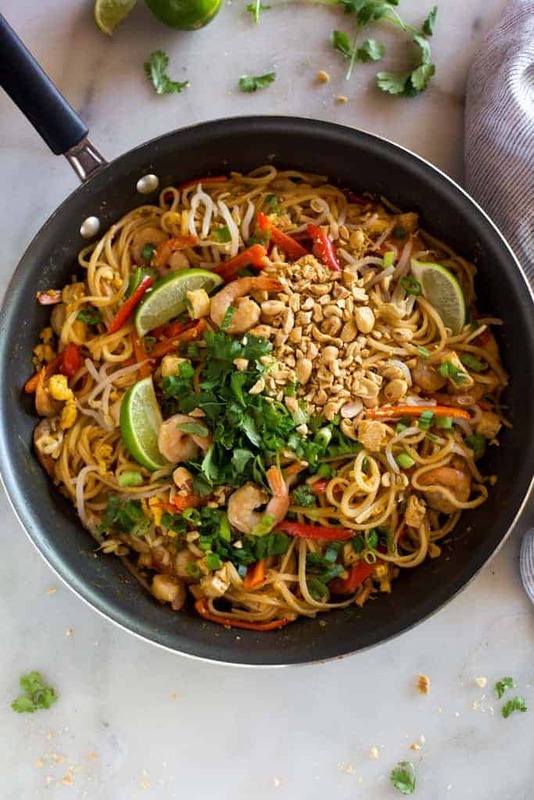 This amazing Pad Thai recipe is easy, approachable and can be made in under 30 minutes, fresh ingredients and a delicious homemade pad thai sauce. Cook noodles according to package instructions, just until tender. Rinse under cold water. Heat 1½ tablespoons of oil in a large saucepan or wok over medium-high heat. Add the shrimp, chicken or tofu, garlic and bell pepper. The shrimp will cook quickly, about 1-2 minutes on each side, or until pink. If using chicken, cook until just cooked through, about 3-4 minutes, flipping only once. Push everything to the side of the pan. Add a little more oil and add the beaten eggs. Scramble the eggs, breaking them into small pieces with a spatula as they cook. Add noodles, sauce, bean sprouts and peanuts to the pan (reserving some peanuts for topping at the end). Toss everything to combine. Top with green onions, extra peanuts, cilantro and lime wedges. Serve immediately! To use tamarind paste in the sauce, substitute 2 Tablespoons in place of the vinegar. this pad Thai recipe is absolutely perfect. This may just be the best thing I have ever cooked at home. It was restaurant quality and delicious. I followed the recipe exactly as written and would not change a thing. Try coconut sugar, it’s an awesome switch! Blends well with coconut aminos. Great recipe—planning to make this again and again! My family and friends loved this!! I made it for my sister & fiance, then again for my bridal shower, it’s a huge hit. Everyone was asking for the recipe. I didnt use the fish sauce. And just used chicken. But it was “better than any restuarant ” my auntie said. I cant say enough good things about this dish. Simple, affordable and so delicious!! Great recipe! Easy to make and flexible too. I took off almost half of the sugar as peanut butter already has sugar in it. It also comes out nice with more eggs. Phenomenal recipe! YUM! Thank you. Super delicious. We made it with tamarind paste from our local Asian grocery and it was AMAZING. I’ve made pad thai before, but this ingredient was really what it’s always been missing. With the peanut butter it makes it creamy and delicious.